At Zero Dark Thirty, my plane left Melbourne for Bangkok, where I had a connecting flight to Kathmandu. I was eager to get to India, but visa complications meant that I had one more stop to make before getting there. Flying into Nepal was a pretty amazing experience. The capital is nestled into a valley at the base of the Himalayas. Travelling up the coast of Myanmar, and then across Bangladesh, the country is mostly flat, and then all of the sudden there is an enormous range of snow capped mountains off in the distance, puncturing the clouds. At the last moment before landing, the plane turned 180 degrees, giving everyone a spectacular view, and then started to descend. From the air, Kathmandu looks like a toy-village made up of low-rise apartment buildings painted a multitude of colours and scattered with no discernible order across the valley. From the ground, it is a densely packed city. My last few days in Australia were fantastic, but in the back of my mind, it occurred to me that I was soon to be entering into something a bit more difficult. I was fortunate that the guest house I was staying at in Kathmandu offered a free pick up from the airport (there’s nothing like seeing someone holding a sign with your name on it to make you feel at ease), but it was soon apparent that I was back in a different part of the world. This was indeed a dry and dusty place. On the drive from the airport, it all came back to me – the cars, motorcycles, bicycles, and pedestrians all vying for space on the same road, sheets of corrugated metal being used as roof and walls, scaffolding made from bamboo, and the profusion of rebar poking out of half-constructed buildings. 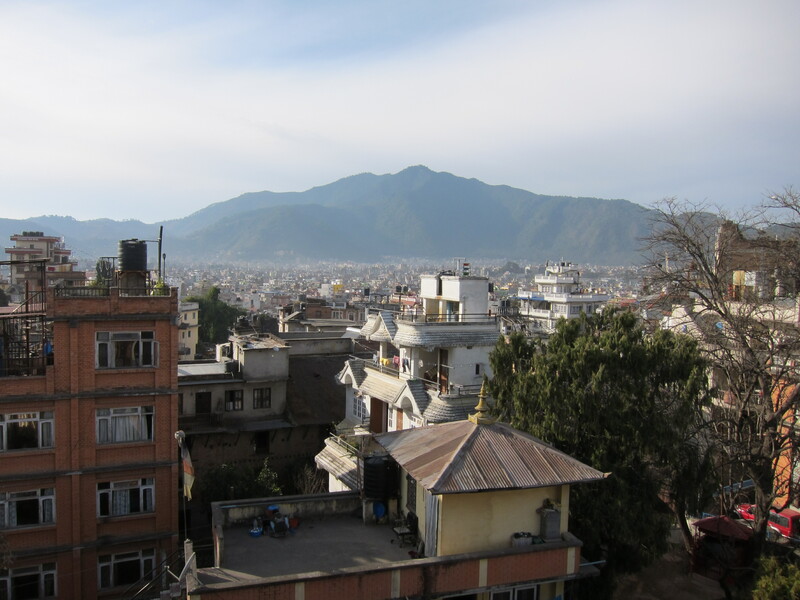 Kathmandu only has a population of 1 million people, but they all seemed to be in the streets, and on the move. The drive from the airport took about half an hour, and towards the end of the ride, my taxi entered into a labyrinthine maze of successively narrower and more densely populated streets. 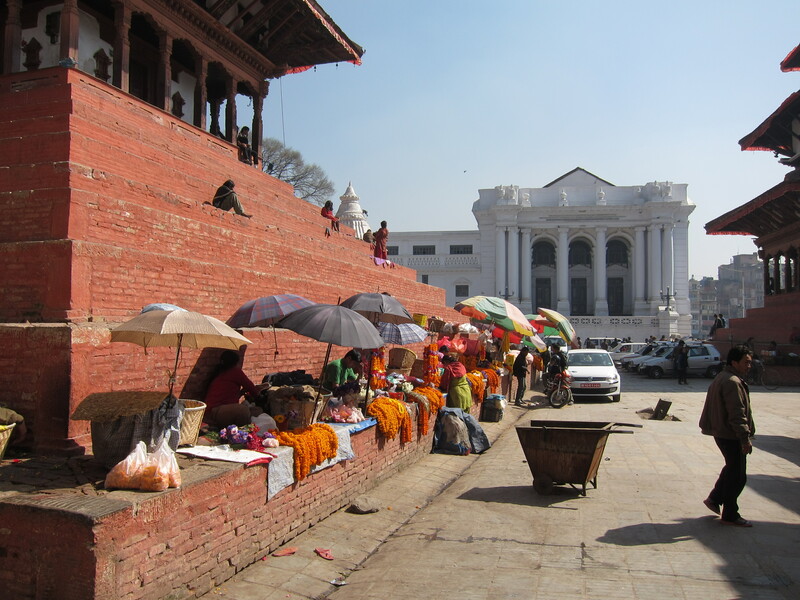 Much like Kao San Road in Bangkok, Kathmandu has a central tourist area, where several convoluted blocks are filled with nothing but tourists and stores catering to tourists. I was staying just outside this area, but close enough that it immediately felt like I was in the thick of it. 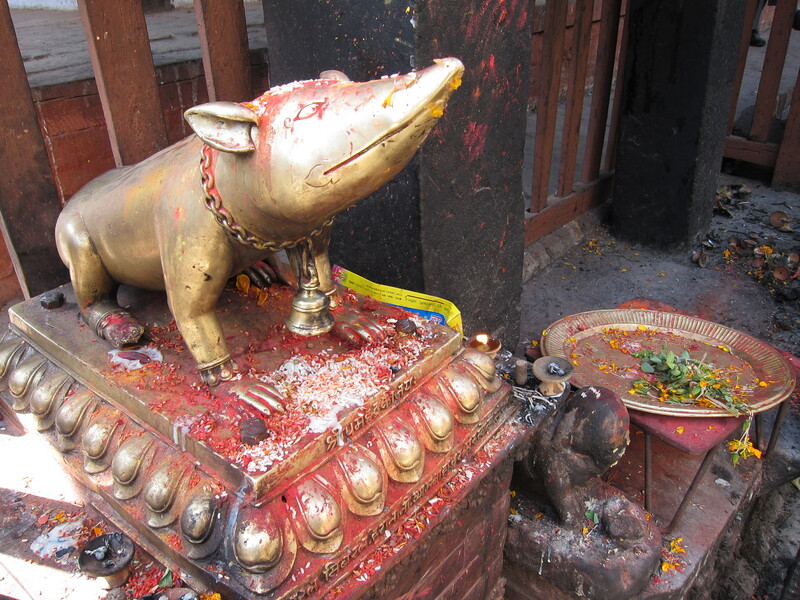 The first day there, a combination of culture shock and jetlag (strangely, Nepal is 5 hours and 15 minutes different from Melbourne time), left me feeling quite overwhelmed. By the second day, however, my reflexes started coming back to me, and I hit my stride, dodging touts and traffic with equal dexterity. 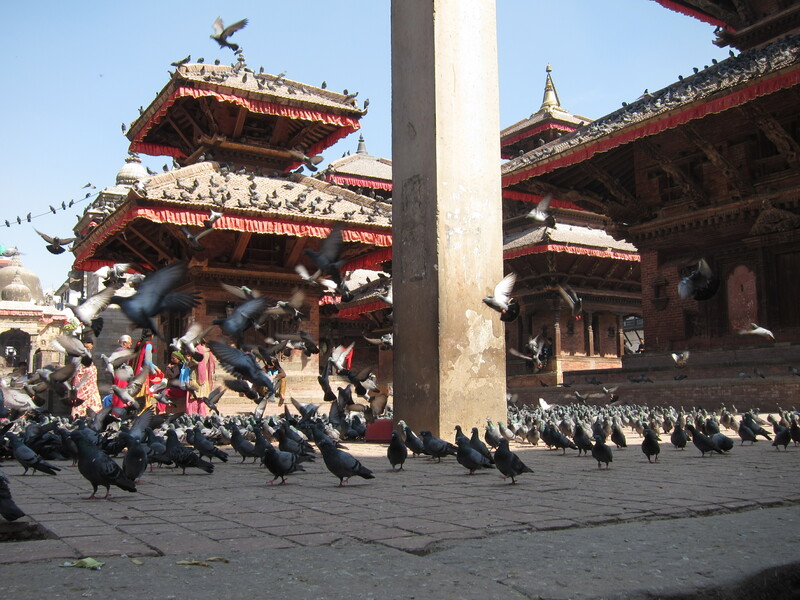 I really only had one full day to explore Kathmandu before heading to India, and I knew I would be back in Nepal before long, so I mostly took it easy, and went to check out the city’s major tourist attraction, a world heritage site called Durbar square. 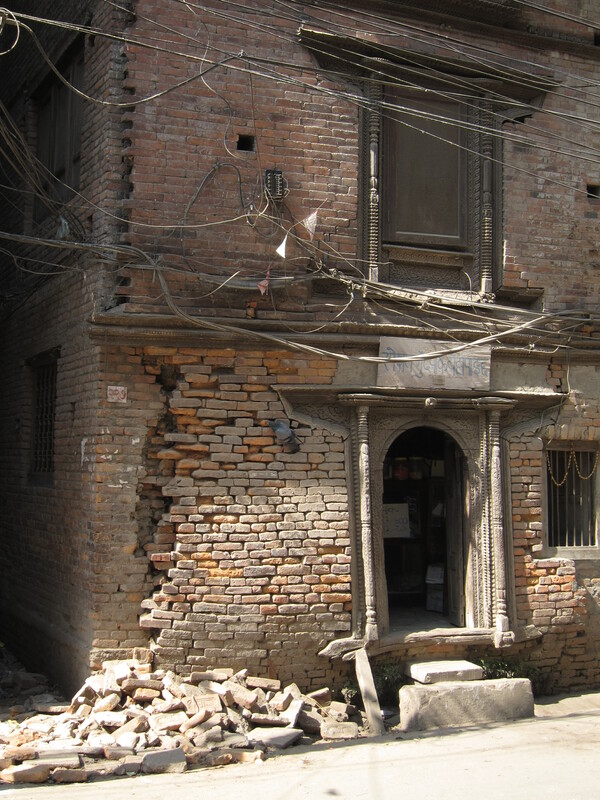 Although it’s called a square, it’s more like a collection of several plazas, which contain the old royal palaces of Nepal. Despite an entrance fee, life in the city seems to integrate seamlessly with the space. 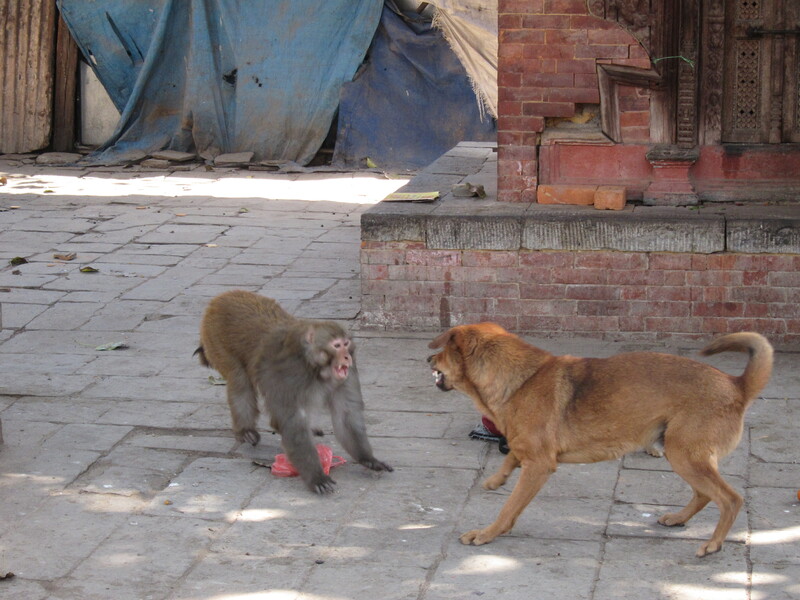 Just as small shrines were commonly located in random spots throughout the city, the square was full of people selling their wares at market, religious pilgrims, people lounging, couples holding hands, and the occasional dog-vs-monkey fight (see below). There is obviously much, much, more to be discovered here, and I can’t wait to return to Nepal after India, but in the meantime, I was to head south, in search of coffee.